Breakfast is the most important meal of the day. And it can be the most romantic too! 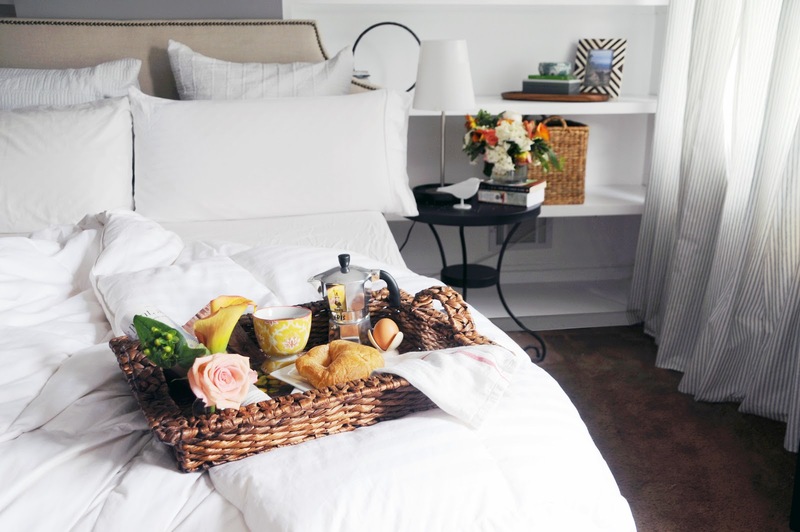 Whether for the morning of your first relationship sleepover (hooray), wedding anniversary or just a simple Sunday, impress your partner with an unexpected breakfast in bed. Cleanse your date night palate with either a hot morning meal or simple store-bought good. Either way, your partner will eat up the unexpected room service! If you’re serving more than cold cereal, be sure to plan and prepare. Check the pantry for ingredients and shop for needed items. Do as much prep work ahead of time as you can. For example, chop fruit, set the coffee maker, pre-measure flour, etc. This will save precious time in the morning so you can get back in bed (with breakfast) faster. In the morning, attempt to wake before your partner and cook as quickly as possible not to wake your unsuspecting bedmate. The element of surprise is half the fun! Consider moving appliances – like a blender or toaster – into another area of the house to limit noise. For example, I once used a hand mixer in the garage not to disturb my sleeping love. If your partner wakes, just tell him/her to “Go back to sleep. I have a surprise.” Your partner will instantly feel the love with your appetizing gesture! Beverage choice may be essential, especially if you need to rehydrate following last evening’s passionate date night. Pour drinks only half to three-fourths of the way full to limit spillage in bed. Maybe even place beverages directly on the nightstand after presenting to forgo potential mishaps. Water: Tap is fine but how about infusing H20 with cucumber, berries or citrus. Coffee: A hot cup of coffee is divine in and of itself. But enrich coffee with flavored syrups, whipped cream and dusting powders. Juice: Add a fruit garnish, such as an orange slice, to a tall glass of juice. And maybe blend an exotic smoothie. Brunch-style: Add a pop of fanciness with a mimosa, Bloody Mary or coffee liquor. Health Nut: Some dieticians recommend a superfood diet centered on three macronutrients − protein, healthy fat and complex carbohydrates – which are the main components needed for the body. So power up with Ezekiel bread topped with mashed avocado and chopped hard-boiled egg. Maybe this power boost will lead to a little “dessert” after breakfast! Grand Slam: You can skip getting dressed to hit the dinner but still have a breakfast glam slam… in your pajamas. A hearty breakfast can be laborious but arguably the most impressive and tasty. Prepare an omelet, pancakes, bacon and toast. 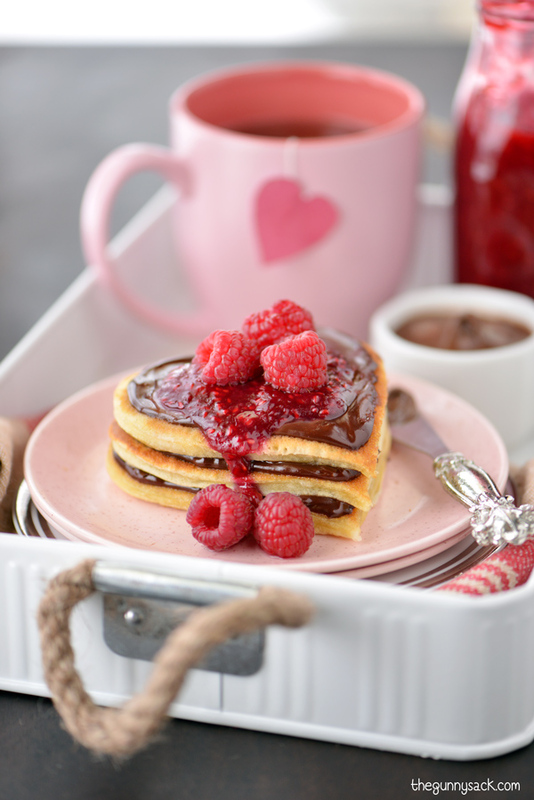 Maybe use a cookie cutter to shape pancakes into hearts. Cultural Cuisine: If you’re love is a fan of Mexican food, whip up breakfast tacos with scrambled eggs and chorizo. A fan of French fare? Bake a quiche with ham, spinach or other combinations. Pastries: Baked goods are a great way to serve bite-sized nibbles and sharables. Try scones with jam, sliced crumb cake and bagels served with cream cheese, lox, etc. Gourmet: If you’re looking to wow with an over-the-top dish, find a restaurant-quality recipe for overnight French toast or top Belgium waffles with infused syrup, fresh berries and whipped cream. Breakfast Casserole: A one-pot dish, like a casserole, will satisfy both chef (for simplicity) and diner (for flavor). Low Maintenance: Skip the cooking and plate pre-made store-bought goods like muffins and pre-cut fruit; or pick up bagels and other baked goods from a local bakery. Jazz it up by using your own serving ware. You eat with your eyes first, so make the breakfast in bed presentation extra appetizing. Tray: Serving trays with four legs are best for breakfast in bed. Find beautiful options at kitchen and bath stores or on Etsy, including trays customizable with initials. If you don’t have a lap tray, using a flat platter or even a lined cookie sheet. Linens: Line the tray with a pretty placemat. Add a pop of color with either a cloth napkin or decorative paper napkin. Consider adding a white doily too. OK, this seems silly but it’s the little touches that make a breakfast in bed experience feel extra special. Final Touches: Garnish plates with herbs or edible flowers. And garnish the tray with a flower too, either placed directly on the tray or in a small vase. As you enter the room with the tray, temporarily place it on the nightstand, dresser or a pre-positioned folding table. Then, fluff the pillows and blankets and help your partner get comfy. Turn on some mood music. Place a towel underneath the tray to catch crumbs from falling onto bed sheets (optional). When the meal is over, offer your partner a newspaper, magazine or the TV remote to let their pampering continue. Head to the kitchen to clean the dishes and countertops. Once your partner is up, change the bed linens if stained from spills or crumbs. For a fun twist on this idea, use the same approach but serve the breakfast elsewhere. For example, set up an alfresco breakfast picnic in the backyard. Or, toss a nice table cloth onto patio furniture for unexpected table service.